Physiotherapy Liverpool | #1 in Merseyside for treatments! At the Liverpool Osteopathic Clinic, we provide physiotherapy treatment for a large range of conditions. Consisting of three main elements (massage, joint manipulation and medical electricity), treatment is aimed at rehabilitating the patient by reducing pain and swelling and restoring normal movement following an injury or long illness. Joint manipulation, or re-mobilisation as it is now called, is perhaps the image most associated with traditional physiotherapy. Medical electricity or electrotherapy, on the other hand, is the latest modality to be added to the physiotherapist’s armoury. It works by sending electrical impulses to the brain that disrupt or reduce the pain signals coming from the nerve, thus reducing the patient’s pain. Massage is now unfortunately being used less and less by physiotherapists because it is highly labour intensive and time consuming. However, it continues to have a place here at the Liverpool physiotherapy clinic because we believe in its unique benefits. Besides instilling feelings of confidence and wellbeing in the patient, it has the direct therapeutic effect of muscle relaxation (or stimulation) and it is an ideal preparation for and complement to a second modality. What conditions can a physiotherapist treat? Most people know that physiotherapists treat bad backs, joints and are often enlisted in sports therapy. Spinal problems are becoming increasingly common in today’s modern world, presumably due to the sedentary lifestyles many of us lead. Too much sitting or standing still for several hours of the day can cause compression in the lower spine and put pressure on the surrounding nerves and muscle. This can lead to poor posture and regular back pain. Physiotherapy can help by engaging the patient in stretching activities; flexibility and strengthening exercises for the whole body and balance and posture exercises. Pain from a slipped disc is usually caused by the damaged disc pressing on a nerve. This can lead to back pain, sciatica, or both. Pain can come about gradually, starting from the lower back, or it may come about suddenly, like a stabbing pain. Sometimes the pain might become so severe you find it difficult to move around easily. With a slipped disc it is often much better to remain active; however if it is leading to a more serious issue like spinal cord compression or cauda equine syndrome, your doctor will recommend the best course of action. 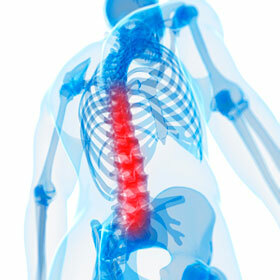 Otherwise, physiotherapy can help by manipulating the spine; using acupuncture and prescribing a program of exercises. Sciatica is when a compressed vertebra in your spine or a slipped disc puts pressure on your sciatic nerve – the long nerve running down into your legs. It is usually only felt on one side and may cause pain not just in your lower back, but in your buttocks, legs and feet. You may find it difficult to sit down, stand still or bend over. Assuming there is not a more severe underlying cause of your sciatica (such as lumbar spinal stenosis or degenerative disc disease), it can be alleviated through stretching, low impact exercises (like yoga or pilates) and massage and muscle manipulation. Joint dysfunction occurs when the cartilage in between the main SI joints is damaged or becomes worn in some way. Cartilage acts as a natural shock absorber for your bones; however when this cushioning becomes compromised it can lead to degenerative arthritis (also known as osteoarthritis) over time. Electrotherapy techniques such as ultrasound can help with the healing process by stimulating the surrounding muscle and tissue; as can manipulation via massage and exercises that improve the range of movement in the joint and seeing a physiotherapy Liverpool can help. Such surgeries include spinal surgery; knee replacement or abdominal surgery. Following an injury or fracture, we can prescribe a program of regular Liverpool physiotherapy sessions that will help restore the muscle or ligament back to its full strength. We will also recommend the best physiotherapy exercises for the patient to do at home. Conditions of the nervous system, for example ME or a stroke, can be managed with successive physio therapeutic sessions. This is usually called peripheral or neurological physiotherapy. Whiplash is caused when the neck, shoulder or upper body is given a sharp jolt or sudden movement that leads to jarring sensation afterwards. It often occurs in car accidents. Whiplash can be brief and will usually subside after a short few days; however if the discomfort persists, then physiotherapy can be a fast and effective way to alleviate pain, usually with just one or two sessions. We use mostly manual therapy, acupuncture and the best in electrotherapy to speed up the healing process and relieve symptoms. We can provide receipts to claim back the cost of physiotherapy treatment with most insurers such as Medicash, Simply Health and Health Shields.